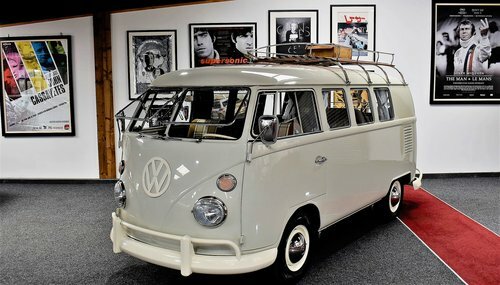 The first generation of the Volkswagen Type 2 with split windshield, informally known as the Microbus, Splits Screen or Splitty amongst modern fans, was produced from the 8th March 1950 through to the end of the 1967 model year. 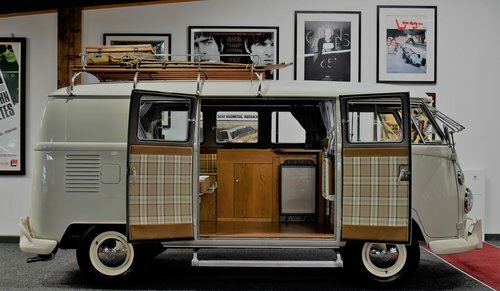 The Splitty cultural revolution is recognised in all cultures and gained it's image and dedicated following throughout the 1960's. 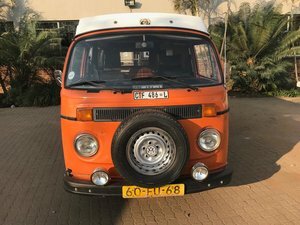 The VW Type 2 has become a cultural icon, recognised for excellent design and timeless looks, today it is regarded very highly by VW fans, collectors and investors at all levels, with the U.S. seeing Type 2 prices move through and past the $300,000 price point. 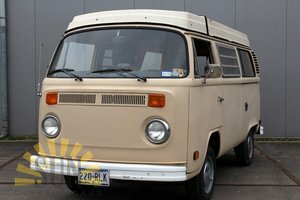 This example was manufactured in Hanover, Germany in December of 1966 in Left Hand Drive configuration and destined for California. 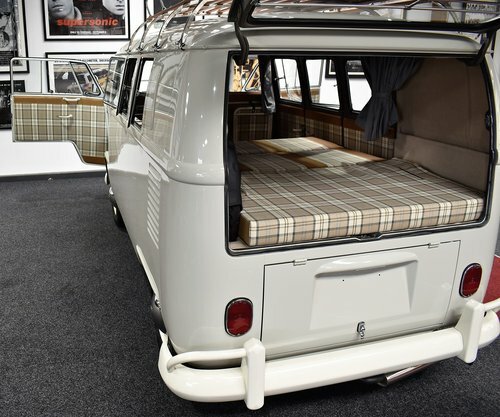 Finished in Pearl White, (code L87) with bespoke tartan/leather seating and door cards, oak coloured flooring and walnut-look ceiling accompany a gas cooker, sink, fridge, and rock and roll double bed. 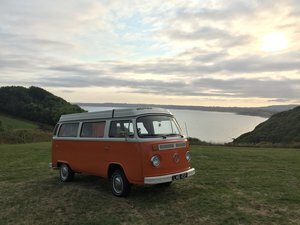 1 U.K owner for the past 12 years who purchased the van in 2005 and was a registered chartered engineer that specialises in metallurgy. Being an expert in metal, he was extremely well qualified to select the finest and most structurally sound example. 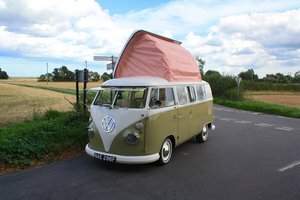 Over the past 12 years, this camper has enjoyed twice-yearly trips to France to visit family and performed faultlessly season after season whilst being placed in careful storage on his Alpaca farm whilst not in use. This current mechanical specification is reflected in the odometer. 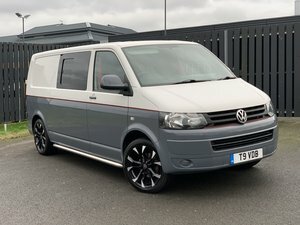 Fully rebuilt by Bears Motorsport Performance Transmissions with top gear replaced and improved to 3.875.1 specification to improve higher speed cruise ability. 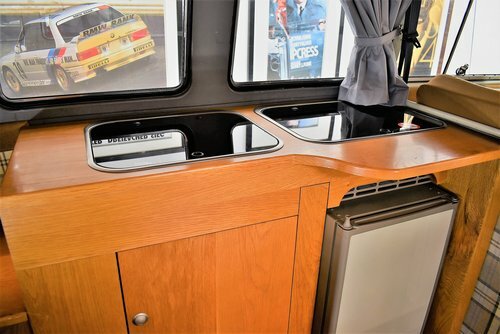 With the increase in power and reduced revs at higher cruising speeds, this camper is capable of cruising at 70mph and can approach inclines with improved vigour and can now offer real-world useability. Fresh from refurbishment, this is one of the highest quality interiors we have ever seen, and so tastefully chosen and well specified whilst retaining a beautiful period feel. All wheels and tyres are fresh from being powder coated and wear brand new Michelin tyres. During the refurbishment the new bumpers, wheels, exterior, and interior metalwork were all taken to be professionally powder coated in a beautiful buttermilk colour that contrasts superbly with the whole colour scheme. 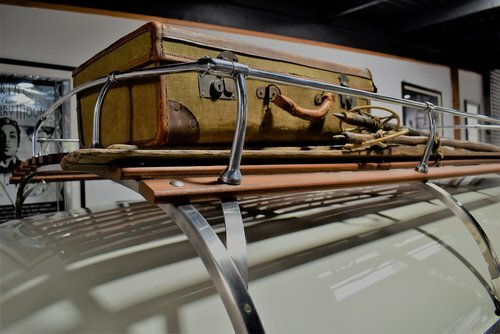 Sourced from Creative Engineering, it is a 4 bow Westy specification with authentic finish, and yes, the suitcase and wooden skis are included! 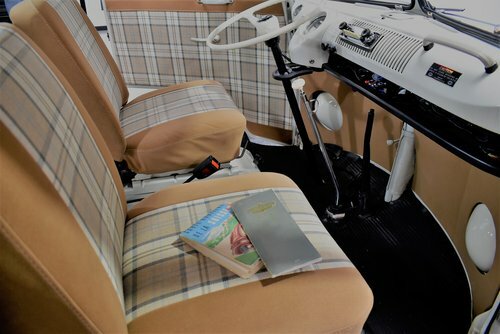 All original side windows are correctly stamped with VW Sekurit markings, the rear window features "jailbars" whilst the beautiful and desirable front "Safari" screens have been retro fitted. There is a substantial history file detailing all mechanical work and improvements over the years. Silverwood will also supply a covering letter giving confirmation of the 2018 refurbishment work completed. 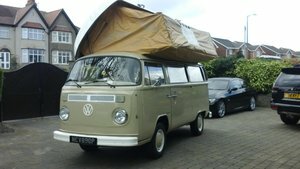 With top tier examples like this proving to be a wise investment over recent years, this example should prove to be a wise, stylish, enjoyable and practical investment that could be enjoyed touring, on days out or classic car events with friends and family. You can call us on 0191 447 2070 to speak to a member of our team on any aspect of our vehicles. Silverwood include an extendable 6 month nationwide warranty. All major credit and debit cards accepted. Finance available, ask us for a bespoke quote.